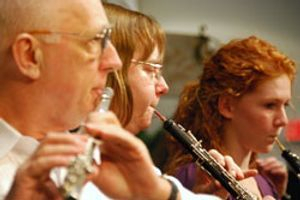 The Orchestra is directed by David Newby, whose energy, enthusiasm, and great artistic talents continue to help the Orchestra grow and develop into a first rate community orchestra. Players serve in an unpaid capacity, volunteering their time to rehearse weekly and perform for the benefit of the community. For an audition, please call concertmaster Gayel Pitchford at (661) 821-7511. Rehearsals are Tuesday nights, 6:30 to 9:00 PM at the Jacobsen Middle School Band Room located in a small building behind the middle school, 711 Anita Drive, Tehachapi. When school is not in session, rehearsals are held at Community Congregational Church, 100 E Street, Tehachapi.